Never in my life had I read a Stephen King novel until just months ago and now I have marked off three on my list. After skimming through so many of his books, I was surprised that I had no idea that he wrote so many books that I had seen on the big screen. I always assumed that his books were just gore and horror without much of a story to tell and I am not sure how that became implanted into my brain, but I am slowly unwinding that thought entirely. Needful Things tells the story of a town named Castle Rock. It's inhabitants seem to be weary of newcomers especially those who open businesses there. They all seem to have a system as to treating new people and never ever seeming too eager by their presence. This seems to be the case at first with Mr. Gaunt who opens a store named (you guessed it) Needful Things. He seems friendly and has an item that everyone seems to need, and when I say need, I really mean HAVE TO HAVE and would DIE FOR! In exchange for these items, these individuals basically owe themselves to this very demon of a man. Before long, he has the entire town turning on and killing each other or themselves as a madness sweeps over them. I enjoyed this book very much. I didn't like it as much as 11/22/63 or It, but we all have our own favorites. I think at times while it was building up for the final climax that it became a bit slow and I struggled to push through, but that didn't last long and the end surely made up for it. 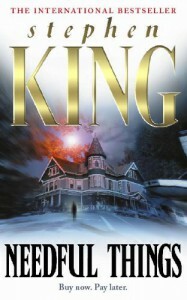 I am now a bonafide King fan and I look forward to checking a fourth book off my King list!